I have been trying to think about the one product I would recommend families consider using in 2015. What one thing will help eliminate chemicals, plastics and other nasties whilst providing mucho money saving? I considered a few – coconut oil and vinegar being two of my faves. But I settled on Soapnuts, primarily because of the savings in laundry powder. 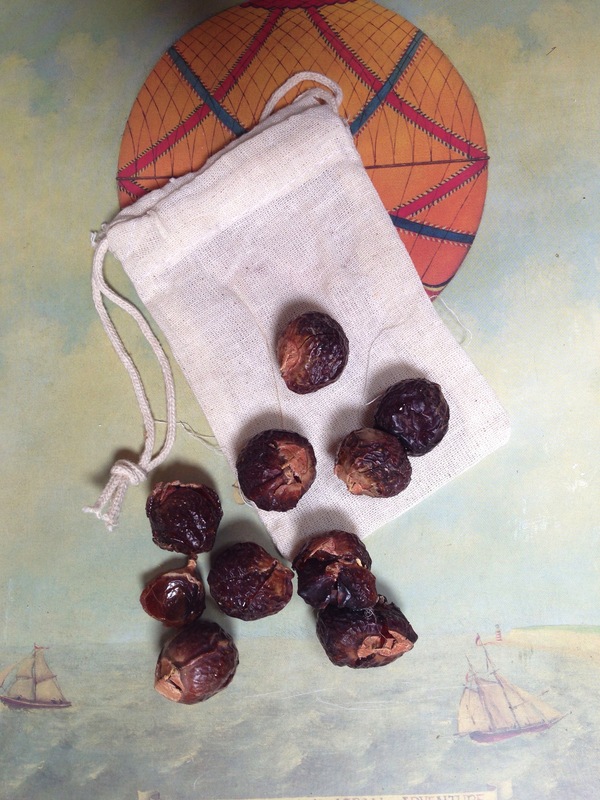 Soapnuts are the berry from the soap tree – I know, isn’t it fabulous?! They grow in South Asia and they are fast becoming known as nature’s best cleaner. It is the saponin within them that can clean everything from clothes to surfaces to hair. It has a natural pong (add essentials oils for sweeter smells) and comes in a recyclable box. You don’t need fabric conditioner and you don’t need to wrestle with containers at the local bulk supply shop. It is a no brainer- the perfect laundry soap. Most boxes of soapnuts (not soapButs as I have typed every single time!) come with a little canvas bag. Pop a handful (see table for precision!) in and away you go! Soap nut water for cold and hand washing: put 10-12 half shells in 1 litre of boiling water. Simmer for about 10 minutes, allow to cool and fill into bottles. I love washing my hair in soapnuts- it makes my hair so soft and shiny and thoroughly clean. (I wrote about this recently for Cosmo). The same process for making soapnut shampoo can make a general house cleaner. Just boil a handful up in a pan of water for 20 minutes and use a spoon of that liquid soap in a cup of water to clean your hair, your body and your dishes! There goes nature – providing for our every need again. Cheers! Would love to hear your number one product for eco living and money saving! I love the idea of these! I’m determined to make our home more Eco friendly this year (starting with bamboo toothbrushes) and these seem like a good idea. I’m hoping they’re eczema friendly as my youngest is itching at the moment so I’ll have to look into them more. Soapnuts! Wouldn’t be without them. Super thrifty, super easy, and so good for the planet. Becky, yes! They’re great for sensitive skin! Also, I use them in cold water washes. I’m inspired!! Here goes….am off soapnut hunting! I did give them a try years ago but am concerned that the growing demand in the western world makes these wonderful nuts too expensive for locals to buy. Have you done any research on that? I’d be quite interested to hear.